Pat Murphy’s 1988 novel, The City, Not Long After, depicts a world where a plague has wiped out most of the population of the world. The city of San Francisco has become a haven for artists, who leave a peaceful life free from coercion in any form. Meanwhile, an army man, Four Star, wishes to forcibly recreate the United States. As the novel opens, twenty years after the plague, his army is moving towards the city. The conflict that this offers to the reader contains a number of intriguing ideas that Murphy explores through the interactions between the two sides. The show down is quite late in the novel, however. The novel dwells for quite a long time on the lives and characters of those that populate San Francisco. They include The Machine, who builds robots that he considers his children as he believes himself to be a robot. After all, how else would he have survived the plague? There is the editor of the local newspaper, who also writes messages which she distributes to the world in bottles that she throws into the ocean. Lily collects skulls to display in department store windows and Danny Boy, another artist, who wishes to paint the whole Golden Gate bridge blue. And there is, of course, Jax, a girl whose mother, though from San Francisco, brought her up in a less well populated area of the country. Finally and this becomes important in the closing stages of the novel, San Francisco, through the ghosts of its past, is a character. Post-apocalyptic worlds are a staple of science fiction and there is always the danger that such tropes become clichéd. Pat Murphy’s novel, by introducing the fantastical element of the ghosts of San Francisco, does something to sidestep this. I was generally sympathetic with the characters. Pat Murphy has created an internally consistent and, thus, plausible utopia. She successfully creates a sense of anarchic community which requires no violence to run smoothly. At some points, though it didn’t particularly bother me, I did have the sense that some people may find the depiction of the characters to be a little irritating. Not everyone enjoys reading about artsy types being wacky. On the other side, you have General ‘Four Star’ Miles and his army, intent upon restoring the past greatness of America. While the people of San Francisco live free of any interference in their lives, Four Star believes that the only way that the US can become great again is through order, which he will deliver at the barrel of a gun. Any written work from before the plague which discusses freedom and civil liberties is considered subversive and he extracts a heavy price from anyone found in possession of such materials. The conflict would seem to be a little one sided. Four Star has an army, which while perhaps not so well equipped as the pre-plague forces, is certainly better equipped to fight a war than a bunch of peaceniks hellbent on creating art. Recognising their limitations and, in a refusal to compromise their way of life, the community refuses to fight the war on anything but their own terms. In this way they channel the likes of Ghandi’s non-violent resistance while using their own superior knowledge of the terrain of San Francisco to ‘fight’ in a guerilla style. For example, those resisting the invading army sneak up on their attackers, knock them out and mark them as dead, leaving a note pointing out that, had they wished to, they could have killed the solider. Those ‘killed’ in this manner should remove themselves from the action. Of course, there is a bit of a problem with all this. The soldier isn’t actually dead and Four Star’s army has guns and training. Though the defenders have many successes, it is clear that ultimate success is unlikely. Murphy resolves this problem in two ways. First, as noted earlier, San Francisco is effectively a character in the novel. The history of the city comes into play as ghosts play a vital part in helping to expel the invaders. More finally, though, the defenders indulge themselves with a piece of violence which, while against their principles, saves the city and prevents more. If we consider the novel from the point of view of presenting peaceful anarchism and non-violent resistance, the shooting at the end is a rather bloody full stop. However, I think that it does give the novel a little more depth and subtlety. The lives that the people of San Francisco have are clearly worth defending and the principles by which they live shouldn’t be shrugged off lightly. They have reached a point where violent resistance and even a killing is a price worth paying. I enjoyed this novel. It’s depiction of resistance to repression and coercion is rooted well in human history and geography. The resolution of the novel, though perhaps a little too neat, does at least avoid an even more unsatisfying conclusion. More importantly, though, although a number of years have passed since the original publication of this novel the themes it explores feel relevant even now. The desire of many in positions of power and influence to reduce the liberty of citizens in the name of security is evident through many of the laws that have been passed or mooted since the turn of the century. While the repression of art and speech might not be quite so overt as depicted in the novel, there is a sense that criticism of the state and its aims is not accepted to the extent that it should be. The City, Not Long After is a charming, witty and most importantly, witty exploration of conflict. As I noted, there are some elements that may annoy some readers, but if you can tolerate them, this novel is well worth your time. Thoroughly enjoyable. Most of the novels reviewed here concentrate on the dark side of San Francisco. They center on the Tenderloin, on crime and street life. Pat Murphy’s contribution, The City, Not Long After, on the other hand, looks at the bright side of The City. San Francisco is, after all, the capital of Flower Power, the city of free love, of gay emancipation, of anti-war protests and experimental art of all kinds. It is SF, the city of science fiction. And so, not long after the Plague, the few survivors amongst the people of San Francisco are playing in the ruins. They want for little. There are shops, offices and homes full of stuff that the dead no longer need. There are parks in which they can grow food, and a market where they can trade salvaged goods with the people of the more extensive farmlands of the Central Valley. And having nothing else to do, they make art. Jax, the heroine of the story, is the daughter of a famous San Franciscan peace campaigner. The full import of her history does not become clear until much later in the book, and I’m not going to spoil the story for you. However, for reasons that you will discover, Jax’s mother flees the City and ends up on a small farm near Sacramento. For many years she is able to raise her daughter in peace and safety. But then The General arrives. General Miles, nicknamed “Fourstar”, is determined to rebuild America. To do so, naturally, he must restore order. There must be government, and because of the desperate state of the country it must be a military government. Everyone must work together in the rebuilding effort, and so ensure that they do all forms of dissent must be stamped out. People should not be allowed to read subversive books from before the Plague that talk about freedom and civil rights and other dangerous concepts. And above all, that annoying cadre of lunatics, layabouts and malcontents that has taken over San Francisco must be destroyed. After her mother’s death, following detention and torture by Fourstar’s men, Jax heads into The City to warn the artist community of the impending invasion. There she meets various colorful personalities: Mrs Migsdale who edits the local newspaper and every day throws cryptic messages in bottles into the ocean; The Machine, who builds robots and thinks of them as his children; Lily, who collects skulls and displays them in department store windows; and Danny-boy, whose ambition is to paint the Golden Gate Bridge blue. The message of Fourstar’s impending invasion is not new. The artists have heard it often enough from traders, although the news that he might actually be on the march is of some interest. Some, like Snake, the former gang leader turned graffiti artist, recognize that a little planning might be in order. Much to Jax’s horror, however, the San Franciscans decide to fight their war, not with guns, but with art. Please consider yourself removed from combat. Look at it this way – we could have killed you. If you don’t stop fighting, we really will kill you next time. Armed with vastly superior knowledge of the terrain, and the surprise that comes from their unconventional tactics, the artists hold out for a long time against the invaders. Many of the troops do defect, as they are encouraged to do. 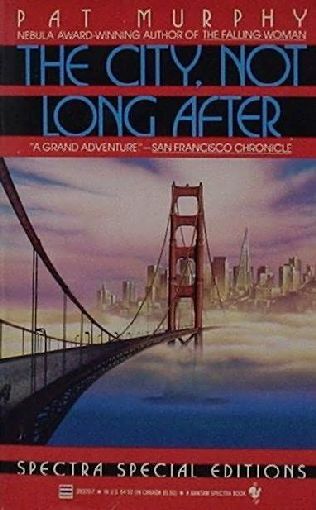 But while this book might be a fantasy (ghosts of San Francisco’s past play a small but vital role in the resistance), it is no naïve Disney fairy tale. Murphy is far too honest to resolve the story without bloodshed. Overall this is a beautiful, delicate and, as I have come to expect from Pat Murphy, highly amusing tale of the rightness of resistance to violence, and of the inevitable futility of that course of action. Peace is something that we can only achieve at a cost. The question is whether the cost we choose to pay is temporary sadness, or permanent subjugation to the whims of General Miles and his ilk. Furthermore, the more Peace we want, the higher the cost, and sometimes that price is never worth paying. The irony is, of course, that the people of San Francisco have, in recent months, along with the population of the rest of America, fallen solidly in line with General Miles’ message. Faced with a dangerous threat from Outside, the people of America have freely given away some of their civil rights (and more significantly most of the civil rights of visitors to their country) and have invited armed men into their lives that they might have Peace without any danger to themselves. These days, few publishers would dare run with a book in which the heroes resist the resurrection of America and describe the American flag as ugly. Perhaps we are in need of a heavy dose of art.